Australia is a country in which “full-rate” ADSL2+ services are popular. This is less common in other countries than you might expect. This post goes into the factors that can impact ADSL2+ performance in some detail. As a result, its fairly long! But: If your ADSL2+ service isn’t working well for you, if you’re not sure if its working as fast as it can, or if you just want to see whether you can make your service work a bit quicker – I hope you find this an article worth reading in its entirety. When ADSL2+ services are configured to run as fast as the line can support, various factors become important in ensuring that your service runs as fast and as reliably as possible. These are factors that don’t typically matter as much (or at all) at lower, fixed, speeds. As a result, an ADSL service that worked fine at lower, fixed speeds can become unreliable, or can demonstrate significant packet loss or dropout rates, when it is transitioned to a ‘full rate’ (or ‘best effort’) ADSL2+ service . An analogy here can be drawn to a motorcycle rider, hammering along a windy road on the edge of a cliff. The faster she rides, the greater the chance of slipping over the crash barrier and… crashing. This leads to the single best way to reduce packet loss and dropouts on an ADSL2+ service, which is to just… slow it down a little. This can take the reliability of such a service from marginal up to ‘rock solid’. Its a non-linear improvement that is, again, comparable to that motorcycle rider and the merits of backing off ‘just a tad’ versus the maximum possible speed on the current road. Conversely, its also possible that your line may be configured at present with performance parameters that are at the other end of the scale – that are too conservative, and in that case, your line may be quite capable of being run at far higher speeds with no loss of stability. These issues might be compared to the process of dealing with the bumps in the road that motorcyclist is riding on; Smooth out those bumps and the ride gets faster, without becoming less stable – and after improving those things, the speed can often be cranked up still further manually to boot. A full-rate ADSL2+ service does the best it can with the current line conditions that you present to it. If your line conditions change, your speed will change too. Sometimes lines get worse (literally, with age) – in a manner that cannot be directly ‘fixed’. Sometimes, the factor influencing speed can be addressed. Its a chain that is only as strong as its weakest link – and (as we’ll see!) there are a lot of links in that chain that can have an influence on the outcome. How good could it get? Its important to be clear on what this graph is and what it is not. It is an indication of the maximum theoretically possible performance for a given line attenuation/distance from your local exchange. It does not guarantee anything about the speed on your particular line. What it represents is an upper bound, not an average, not a lower bound, and not a promise. In essence, you should expect your performance not to exceed this level (though in some exceptional circumstances it might). Over time, achieved performance in the real world can gradually reduce due to various factors, such as the presence of other ADSL services in the same cable bundle as your own causing ‘cross pair interference’, and the progressive degradation of the wiring (and more often, the wiring joints) in the copper line running back to your exchange. These are often things you can’t do anything to improve. Also, achieved performance can ‘suddenly’ change too, due to factors (such as those listed below) which can cause a step change in the quality of the end to end chain of electronics and cabling that makes your high speed ADSL2+ service possible. These are often things that you can do something to improve. This might sound elementary, but some routers are running software and hardware that is less than perfect and that can develop some forms of ‘bit rot’ after running for a long time. In addition, over the course of a long held ‘full rate’ connection, short term bursts interference and other similar factors can lead to some router chipsets progressively disabling ‘buckets’ (64k chunks of overall link capacity) in the connection. This can lead to your connection getting progressively slower in small increments over time. Depending on the router, chipset, and what caused the buckets to be disabled in the first place, those chunks of disabled line capacity don’t necessarily come back again once the line interference passes. Power cycling your router (turning it off, waiting a few minutes, and turning it on again) can sometimes do a world of good. In a perfect world you wouldn’t need to do that. But here in the real world, its really the very first thing to try before working harder to fix an issue with slower speeds than expected. It also makes sure that your router hardware is clear about who is in charge in the relationship. This is usually the most effective single thing you can do – it won’t make things worse, it will eliminate this (single most common) cause of problems, and it almost always helps to some extent. In some cases, this work can raise the speed dramatically. This is because having one installed results in a new, clean, wiring path from the incoming connection in the street to your ADSL2+ router, bypassing any bad wiring or incorrect filtering in your premises. In the case of customers using Naked DSL services (where no splitters are needed at all), having a licensed cabler run a new cable to your ADSL router and physically disconnecting all other cabling in the house from that incoming line is the equivalent thing to do. Doing this has the same potential for (sometimes dramatic) performance improvement if you have old, crufty, or complicated wiring in your premises. And once you’ve done this, you don’t need in-line filters in the rest of your house any more – making your life simpler (and more flexible) in terms of your use of that phone line for ADSL and non-ADSL devices. Unless you’ve actioned the previous step (to eliminate this issue entirely), its important that you properly filter all non-ADSL devices. That literally means anything at all on the line that is not your ADSL router. Every other device, regardless of what it is, needs an inline filter (unless you have centrally split/filtered your premises as above). That includes phones, fax machines, Foxtel box phone line connections, alarm systems, answering machines, extension bells… whatever and whereever they are attached, they need a filter. If you have more than three such devices attached along with your ADSL router, you will find that you are likely to suffer ADSL performance problems and dropouts, and that Central Splitter really is the way to go. That removes all device-count limits from the line as well as removing the need for separate in-line filters at all. Common symptoms of un-filtered devices on your line (beware, especially, things like old monitored alarm systems, even if they are switched off) are that the ADSL service drops out when there is an incoming phone call and/or when an outgoing phone call is made, and the presence of audible electronic ‘hash’ (noise) on the line when you make a voice phone call. If you have not, or can’t, or don’t want to, install a central splitter or have your wiring professionally checked, and if you have no more than three such non-ADSL devices, you should also check your inline filters are good ones. Many older filters are not actually rated to work properly with ADSL2+ and their presence substantially reduces performance or tends to lead to frequent drop-outs. And some cheap filters are just… cheap. If you’re not sure, replace them. They don’t cost a lot compared to the frustration that not replacing them can cause. Try different ADSL2+ profiles via the Internode profile changer. You may find that you can move to a higher performance ADSL2+ profile and get a faster, but stable, connection. Though if you find the connection is not stable, simply move back to a more stable profile. In the end, for almost everyone, stability actually matters far more than absolute speed. To do this, Internode provides a variety of line profiles that you can select between on your ADSL2+ “Extreme” or “NakedExtreme” (or Agile port based Internode Easy Broadband service). These can be viewed and configured online by logging in to “My Internode” and then selecting the profile changer. It is also possible to request the moving of your service to a ‘stability’ profile on other ADSL2+ service types offered by Internode – though this must be done by a manual request to the Internode helpdesk. These line profiles represent a spectrum of alternatives that you can think of as points along a line. At one end of the spectrum, on that line, is the greatest possible speed. Along with that speed comes the lowest possible ‘Signal To Noise’ (SNR) margin, which is the margin available to overcome line noise or signal degradation factors that may be present. It represents that motorcyclist running flat out and hoping he doesn’t hit a bump in the road or… ‘oops’…over he goes. At the other end of the spectrum is greatest possible stability – with a consequent reduction in achieved line speed (sometimes a large reduction in that speed, in order to generate enough signal margin to make the link work reliability under current line conditions). At this ‘stability’ end of the spectrum, the service can withstand a quite substantial level of external interference of all sorts, without dropping out – but it will be slower as a result. Currently, new Internode ADSL2+ services are configured with an initial line profile somewhere in the middle, but toward the ‘stability’ end of the spectrum. This ‘ADSL2+ Initial’ profile includes the a nominal downstream data rate limit of 8 megabits per second. Thats really quite fast – but not as fast as ADSL2+ can potentially provide. Limiting this speed maximum in this way creates a very much larger margin for errors and line noise (SNR) than running ‘flat out’ does. It further increases stability against line faults and line noise as a result. The aim is to ensure that our customers have a stable connection if they are unaware of the various factors in this post, and if they have not yet considered the implementation of the many steps possible (as listed here) to potentially improve that situation. You are very welcome to try, and you are encouraged to try, various different line profiles to see how they perform on your line. In doing so, you can find the one that, right now, represents the highest speed you can obtain while still keeping an acceptable level of connection stability (i.e. the best trade-off between speed and stability for your current circumstances). Once you have run through the rest of the items in this checklist, and have improved your line conditions as a result, you may find that you can then come back and ‘crank up the speed’ somewhat more on your line by selecting a profile further toward the ‘speed’ end of the spectrum of choices provided to you. An isolation test simply means – disconnect all non-ADSL devices from your phone line to see whether the ADSL service gets faster (or stops dropping out). If it does, then something you unplugged is the source of that reduced speed and/or dropouts. If you do see such an improvement, progressively re-connecting other devices will help to you find the source of some (or all) of your reduced performance. Every device you re-connect (up to a maximum of three) also needs to have an ADSL2+ certified line filter in the line; Alternatively a central splitter does this splitting job just once at the ingress point in your premises and you do not then need (and should not then use) line filters on any individual devices. And you no longer have a limit of three other devices that you may attach. This one sounds counter-intuitive, but if your achieved ADSL2+ speed is in the 4-6 megabit per second range, try locking your modem into ADSL1 mode (or using the Internode profile changer to lock the DSLAM port into full-rate ADSL1 mode – both achieve the same outcome). We observe that this can often provide higher speeds for some customers than ADSL2+ can, and can sometimes cure drop-out problems that are present in ADSL2+ mode as well. There are sensible reasons for this, based on ADSL1 being a fixed power protocol, and ADSL2+ being variable power based on line conditions; In this intermediate speed realm, ADSL2+ can have a tendency to be ‘too nice’ compared to neighbouring ADSL1 services in the same cable bundle, by not using quite enough output power to be heard over the worst case line noise. So sometimes, rather than getting mad – you may find this is a way to get even. Different ADSL2+ routers perform differently under various real world line conditions, due to having different ‘chip-sets’ that implement ADSL2+ and to having different software ‘tuning’ of how the ADSL2+ chip-sets are used. If you feel that your current ADSL2+ performance isn’t consistent with your line length and/or expectations (and providing it isn’t your expectations at fault), you may see better performance with another brand of ADSL2+ router. Sometimes, routers become faulty, too. We have seen routers ‘half’ failing at times, in a manner that means they still connect, but at lower speed and with frequent dropouts. Make sure your physical connections are tight – that you don’t have a loose phone plug or socket. A loose or dirty connection between two cables, or in a wall socket or router socket, can have a huge negative impact on performance and stability. Similarly, a long phone extension cord can have a large negative influence as well. Eliminate all excess cable length that you can, check your connectors, and ideally move your router very close to your incoming connection and use either ethernet cable or WiFi to then connect onward to your computers, rather than running a long internal phone extension cable or (worse) multiple connections with joiners in series. Try powering them down or unplugging them and see if performance changes. We have had cases where an external hard drive has substantially lowered the performance of an ADSL service, or has even caused the ADSL connection to consistently drop out each time the hard drive spins up! Such situations are usually addressed with physical separation of the devices concerned and/or with the installation of a UPS to stabilise and noise-filter the incoming power supply to the ADSL2+ router. The incoming ADSL2+ signal is highly sensitive to electronic impulse noise and to cross pair interference. Use the shortest cabling you can, and try to avoid having the cabling cross over power cables any more frequently than is absolutely necessary. Try to avoid the presence of coiled up phone cabling as well, as this can increase the influence of external noise sources. Speeds can be impacted by such factors to a surprising extent (sometimes up to multiple megabits per second), especially on lines operating at high speed (20 megabits per second or more). Simply moving the your patch cable further away from power cables can be the cheapest performance improvement you’ve ever made. When a line is not performing according to expectations, and if you are using a very cheap router – consider borrowing or buying a better one to see what difference that makes. At the worst, this sort of changeover test eliminates your router from consideration as a potential problem source. This is very valuable diagnostically. It may help! Even if it does not, trying another router is diagnostically very valuable in eliminating this potential source of performance issues. Auto-sensing of speed and duplex of ethernet cabling is built into most ethernet switch ports and computer ethernet ports these days, and most people find that it ‘just works’. However, a specific common failure mode can be a decision to lock down a specific speed (10 or 100 or 1000) or a specific duplex setting (half or full) on an ethernet port, without configuring the device on the other end of the same cable to exactly the same configuration. It is worth appreciating that fixing a port speed and duplex on one side, while leaving the device at the other end of the cable in auto-configuration mode is a really bad idea. This frequently results in the auto-configured end managing to auto-configure to the wrong duplex setting. The wrong duplex setting means that one end is running on ‘half’ duplex and the other on ‘full’ duplex mode. This causes all sorts of performance issues, which worsen rapidly with increasing data flow and with applications that move data in both directions on a cable at once. They often manifest as a connection that seems to work fine at very low utilisations, but that turns to mush when high capacity data transfers are attempted on the line. The rule is: Both ends of a cable must be set to auto, or both ends must be set manually (and to the same configuration!). Anything else is inviting problems. There are all sorts of potential wiring faults in your premises – especially if the building is an old one. This can include the presence of ‘unterminated’ sockets, the use of old and/or rubbish cabling in your roof space, and the presence of partial or total short circuits (which can be caused by things such as a cable being trapped into a corner and stretched, or otherwise subject to shearing or crushing forces by being caught in some physical thing that has moved down onto the cable). A central splitter (on line-shared services) and/or having your wiring physically checked by a licensed cabler (all DSL services including Naked DSL) is the single best thing you can consider to both performance optimise your service today, and to insulate it against a number of forms of cabling fault that may develop later. A monitored alarm on the same line creates special challenges beyond just the use of simple in-line filters. Such an alarm (whether switched on or not) will have an adverse impact on ADSL performance unless it is properly wired in by a licensed professional cabler. The best approach is to either have the alarm professionally re-wired into the house line wiring by a licensed cabler who can install the appropriate filtering, or to remove that line connection and move to the use of an alarm that links back to the central monitoring centre using either a connection over your Internet link, or a connection via a mobile phone network modem. These alternatives are now widely available. The use of WiFi, while very very convenient for many people, also introduces a potential source of slowdowns, packet loss, and similar problems. It is very common for WiFi connections to become a performance bottleneck that limits the overall throughput of an ADSL2+ connection running at high speed. It is also common for a WiFi signal to become masked or blocked (or to just be operating over too long a range) and for this to create the appearance of an ADSL fault when its actually a WiFi problem. The wireless standards that have the greatest potential for these problems happening are those that work in the ‘2.4 Gigahertz’ spectrum range (such as the original 802.11b WiFi standard). The simplest way to prove whether your WiFi is a factor in reducing performance is to bypass it – plug your computer into a direct ethernet port and compare the performance outcome compared to using WiFi. If your performance gets a lot better – then you’ve found your performance bottleneck and you can either accept that bottleneck or change your WiFi configuration to overcome it. The very latest versions of WiFi (802.211n) offer very substantial improvements in speed, range and reliability and are well worth considering if you need to rely upon wireless access from your computer(s). Note that 802.11n can of course only work if both your base station and your end-point computers all run it. Otherwise it will ‘step down’ to an older 802.11 standard that runs at a lower speed. Bluetooth runs in 2.4Ghz, so if you are using Bluetooth and a 2.4Ghz WiFi network, try turning Bluetooth off to see if your broadband performance improves. Despite most Bluetooth and WiFi services coexisting fairly well, some combinations of Bluetooth and WiFi services do severely interfere with each other. The simplest workaround if you want to keep using Bluetooth in use and you see WiFi interference is to move to using WiFi in a band other than 2.4Ghz. Similarly to the Bluetooth scenario, many popular cordless phones run in the 2.4Ghz wireless band and these can conflict with WiFi access, resulting in lower broadband performance and/or in problems with using the cordless phones. The solution is to move to cordless phones running in a different band (e.g. DECT phones or otherwise); Or alternatively to move your use of WiFi to a frequency band other than 2.4 Ghz. If the router needs power cycling to recover from a line ‘dropout’, the router has a firmware bug – and you should look to upgrading your firmware to a newer/better version and/or consider changing brands of device entirely if this problem persists. Some routers get hot, and can then become unstable (so they drop connections, so they have trouble connecting, or so they start running slowly or erratically). Other than replacing them with better routers, a workaround for ‘hot routers’ that has been seen to work by some (other than simply moving the router away from other hot electronic items) is to run these routers on their side. This which seems to help with heat dissipation from the box for some models of router with such issues. Ensure your router is an ADSL2+ model and that it is actually configured in ADSL2+ mode! It is worth ensuring that your router actually supports ADSL2+ and that it is connected in ADSL2+ mode if you wish it to do so (check the router status screens in the web interface of your router to make sure). It is possible to lock an ADSL port into ADSL1 mode. Sometimes this is done intentionally to try to stabilise a connection when other approaches fail to do so. But if your connection is running below 8Mb/s and you believe it should be faster – check and (if needed) change this before looking for other explanations. Some power adaptors for ADSL2+ routers are, bluntly, cheap and nasty. In particular, they can be badly regulated, resulting in the output voltage being too high or too low or varying over time. Even more importantly, these power adaptors may suffer from voltage drops during brief voltage drops in the incoming 240V power supply to your premises, or in response to other devices on the same circuit drawing a large surge of power from the line. Better quality power supplies contain enough circuitry to be able to ‘ride out’ brief drops in the incoming power quality. The best approach here is to buy and install a UPS (un-interruptable power supply) unit and to plug your router into it. While you are at it, putting in one that is large enough to run your computer from as well is also a great idea (and may stop that mysterious intermittent crashing problem you have at the same time – this is the cause of a lot more unexplained crashes in computers than you may expect). Not only will the use of a UPS eliminate this potential source of line dropouts (which is a surprisingly common cause), but it means that if you are using a laptop for Internet access, the combination of the built in battery in the laptop, plus the UPS powering the router, will provide you with Internet access during a power failure. Using the UPS to also power the base station of your cordless phone will provide you with the benefit of continuous phone service during a power outage as well. Note that some sources of voltage drops can be very local (e.g. large household appliances on the same circuit, such as airconditioners and fridges). Others can be remote (e.g. the next door neighbours’ high powered electric welder). A UPS usually overcomes all of these factors and provides additional benefits. 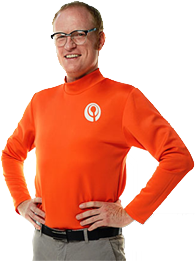 It is cheap insurance in a number of regards. We have seen several instances of external attached hard drives or other electronic devices on the same power circuit as an ADSL router that cause ADSL router instability (via voltage drops or the transmission of electromagnetic interference into the router via the power circuit path, or even via the phone line path). An isolation test involving the disconnection of all non-essential electronics can help to determine whether this is a factor in your installation. Sometimes there can be devices in your premises that require filters, but which you don’t know to be connected (old alarm systems, foxtel boxes installed by someone who failed to add a filter, etc). Again, having a central splitter professionally installed (for ADSL along with a voice line service), or simply having your wiring checked (Naked and line shared services) by a licensed cabler can make a huge positive difference. A ‘Bridge Tap’ refers to any significant run of phone line cabling that is patched in to your line and that heads off from a ‘T-junction’ that ends in an unterminated socket (a socket with nothing in it), or which may simply snake around the roof a bit before just ‘ending’ up there. A bridge tap (a piece of wiring of a given length with nothing on the end of it) causes a specific frequency in your line to stop being useable by ADSL. Some models of telephone (most infamously, the Telstra Touchfone T200) draw bursts of power from the phone line at intervals, to recharge an internal capacitor that in turn powers the circuit that ‘remembers’ your speed dial numbers. Each time the T200 pulls a pulse of power, this can cause an ADSL dropout. The remedy is the redeploy any such phones as doorstops. Sometimes people observe that the ADSL line speed looks great, and downloads from ‘nearby’ or ‘local’ servers (such as mirror servers provided by Internode) work well, but download speeds from distant (overseas) sites are far slower. This is a common problem for many computer operating systems made in Redmond, Washington, USA (and some others). If you are running Windows, in particular, if you see this effect, and if you haven’t yet tuned your TCP/IP stack (Google for ‘Dr TCP’ and/or for ‘tuning tcp window size’) – its worth trying this. This ‘TCP Window Size’ issue is something you can prove pretty easily. It is almost always a problem if you observe that one download from a well connected, but internationally distant, server is slow, but that two or more downloads from that location at once all run at that same speed – meaning that you can generate an aggregate download speed that ‘fills’ your connection if you do multiple downloads at once. If working through this document doesn’t resolve your ADSL2+ speed issues, and you strongly believe that your performance should be higher at your current location, please contact the Internode helpdesk. Start off by indicating that you have worked through this entire document and tried everything in it – and be prepared to confirm the results of your isolation testing, and to indicate whether you have had your premises wiring checked and/or a central splitter professionally installed by a licensed cabler, as this information will help the support person to provide the best results for you. Ultimately, the optimisation of ADSL2+ line sync speed is a tradeoff – between how much time and money you are prepared to spend on it, versus the benefits in your own mind of that expenditure, should it improve your line speed or connection reliability. 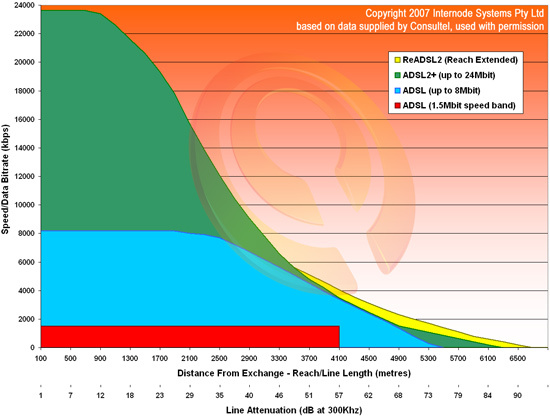 For some people, stability without all this effort is more important than absolute speed – and for those people, the pragmatic answer is to use the Internode ADSL2+ Profile Changer to select a progressively higher reliability ( and hence lower speed) connection profile until an acceptable compromise is reached in terms of connection stability. If that stability comes at the price of a large drop in connection speed and this drop is too large to ignore – well, thats what this document is for! In most cases, you can improve your performance by working carefully through this checklist and implementing those steps that apply to your situation. Once you have done so, it is possible that you can then select a higher performance profile in the Internode ADSL2+ profile changer again, and convert your increased stability back into higher speed without a drop in that stability – a win-win. This is (of course) the primary determinant of attenuation on a line. The physics at play here – as per the performance graph we saw earlier – lead to the simple result that the longer the copper line, the lower the maximum possible speed becomes. In a little more detail, what happens here is that the longer the line, the lower the maximum useable frequency becomes on the line. ADSL works by splitting the line up into chunks of spectrum (frequencies), and in each of these ‘buckets’ a 64 kilobit per second path is attempted by the ADSL chips at each end of the line. As line length gets greater, the frequency at which these buckets just don’t work gets lower and lower. This ‘roll off’ removes buckets from being viable and as each one is deemed un-viable, there goes another 64 kilobits of line speed. This can come from surprising sources – not just sources local to your house, but also from things as direct as a high powered AM Radio transmitter that is near to your copper line somewhere on its path back to your local exchange. These interference sources can knock out a cluster of ‘buckets’ from being able to work at all – meaning that despite the downstream attenuation figure implying a given speed, the real world maximum speed may be quite a lot lower. As indicated already, ADSL2+ does the best it can with what it is presented with in terms of spectrum that it can use on the line. But sometimes, these factors can remove substantial parts of that spectrum from play. Sometimes external interference of this sort can be reduced by trying different ADSL2+ line profiles and/or by the installation of appropriate Radio Frequency ‘Chokes’ on the incoming phone line cable. This is a medium to long term factor that will ultimately become a significant cause of reduced performance in high density service areas that wind up with a lot of copper based xDSL services running in the same cable bundle in the street. This factor is the main reason why the theoretical maximum speed graph we presented earlier is expected to become harder and harder to attain in practice, in higher density, higher takeup areas. In such high density-of-takeup areas, and on a progressively downward basis, everyone starts to slow everyone else down. A bridge tap is created when your line had a previous history in serving another premises, and as a result, there is a run of cable (sometimes quite a long run) that runs as a ‘spur’ from a Telstra jointing pit or jointing mushroom, off toward the previous end point of your line. Each bridge tap creates what amounts to a tuned antenna, and this has the effect of rendering one part of the overall ADSL2+ spectrum unavailable to your router to use. The more bridge taps on your line, the more chunks of ADSL2+ spectrum become unuseable, and each of these costs you some line speed. Bridge taps are an instance of a factor that can lower the available line speed even when the line ‘attenuation’ figures rendered by your modem suggest that a higher speed should be possible. The attenuation figure rendered by your modem is a single axis measurement of a wide spectrum service. Reality, as always, is a lot more complex than any single number can measure. A lot of old Telstra cables suffer from water ingress into joints/pits during serious rain. Had any rain of late? Many old cables are aerial and hence are vulnerable to being put under mechanical stress by high winds – had any of that lately? Unfortunately, it can be very hard to get Telstra to fix copper line faults which are intermittent, via your DSL provider – Telstra simply have no incentive to do so, financial or otherwise, and indeed some serious incentives to ignore your provider when when we report such faults. However, they do to take notice of audible faults reported in a retail voice (PSTN) service. So your best best, if you happen to have increased/noticeable ADSL problems and you also notice that you also have audio quality problems with phone calls (crackly line, lower than normal voice amplitude etc) is to report the fault to Telstra as a voice quality problem. If you can hear voice faults (low volume level, crackling, intermittent sound) – call your voice provider (immediately, before the fault disappears when the weather changes again). Usually the ‘fix’ (if one is performed) involves repairing or replacing cable joints or segments of the overall line path that have either suffered from mechanical or chemical stress, or that have insulation flaws allowing the ingress of water in to the joint concerned.